Ionic Stainless Nerf Bars are made of 304 Stainless Steel. This not only makes them extremely strong and weather resistant, but they polish up to a near-mirror shine, too. The Ionic 6" Nerf Bars include a wider than normal step that insures safe entry and exit from the vehicle. Ionic Nerf Bars can be installed with no drilling required on most applications, making this a quick and easy way to help get into and out of the vehicle. All Ionic Stainless Nerf Bars come with a limited lifetime warranty. The Ionic Stainless Nerf Bars are some of the best nerf bars on the market. Ionic bars are a great choice for harsh environments with a stainless finish. They are built strong and feature wide step pads to ensure that you and your passengers enter and exit your vehicle safely. 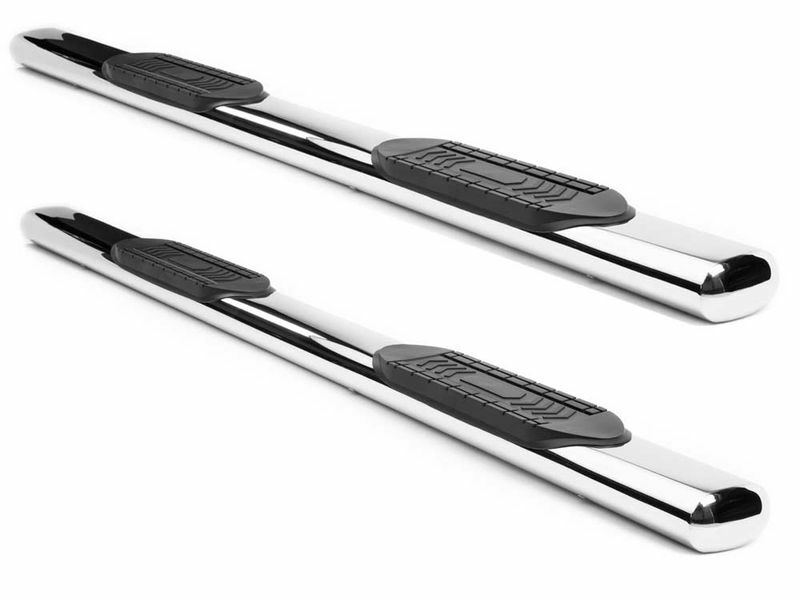 When you purchase these Ionic Stainless Nerf Bars for your vehicle, they come with a Limited Lifetime Warranty! This protects the product from any damage that may occur due to manufacturer error. The package includes 2 nerf bars and a set of brackets perfectly made to fit your vehicle. The brackets are black powder coated to look great on your vehicle. Bolts and an installation sheet complete everything other than simple tools necessary to install the product. We have a warehouse dedicated to running boards and ship out 100's of sets every day. In most cases, the Ionic Nerf Bars ship out within 24 hours. However, we ship these bars out at a rapid pace. We'll be sure to get your tracking number as soon as possible. The Ionic nerf bars can be put on in your drive way with just a few simple tools. There is no drilling on most vehicles. The brackets were engineered to take advantage of existing holes in the body on most vehicles so that these nerf bars can be on your vehicle in about an hour. For any other questions please give us a call. We've installed these 100's of times, and know they fit!